After seeing Simran of BombayFoodie baking some delectable breads from A Year in Bread I too decided to take the plunge.After missing it for past month,I did not want to miss this time as well.My chosen bread was Kevin's Focaccia with grapes and rosemary.I cannot say mine was as perfect though. Though the topping was grapes I was not sure how the result will be.So I decided to make 2 focaccias from the dough and made one with grapes and dried rosemary( had run out of fresh rosemary and could not buy more ,just my luck!) and other with cherry/grape tomatoes and fresh basil.I loved the tomato one but my husband who normally likes tomatoes went for grape one.Only thing he complained was the lack of more grapes!. recipe itself was quite simple and easy except for the proofing/rising time. In a big bowl,add warm water,yeast,sea salt,EVOO and 3 cups of flour.Knead to form a dough adding additional flour as and when needed.It took me just 1/4 cup more though it took one more cup for Kevin.Thoroughly knead the dough for about 10 minutes or more.The dough will be moist but not sticky. Put the dough on a lightly floured surface and knead into a round ball.Keep the dough in an oiled/sprayed bowl turning it once so that it gets a coating of oil and keep the bowl covered in a plastic wrap.Allow the dough to rise until double in volume about 1 -1 1/2 hours. Line a baking sheet (I also used a glass pie pan) and then oil or spray the liner.Put the dough on to the sheet and let it rest for 5 minutes.Then what I did was divide the dough into two almost equal parts and then with oiled hands stretched the dough half onto the baking sheet till it was almost 1/2 inch thick rectangle.If the dough resists then allow it to rest for 5 more minutes and then continue stretching. Make small indentation on top of the rectangle using fingers and spra olive oil on each of these indentations.Press the grapes into these indentations and then sprinkle chopped rosemary and sea salt on top.Cover the dough with a plastic warp and let it rest for about 30 + minutes until doubled.For the second half I used cherry tomatoes and chopped fresh basil. Bake in a preheated oven at 375F for 20-30 minutes or more until it turns golden brown.Since I went for smaller ones I went for 20-22 minutes .The tops were not browned though the grapes slightly shrivelled,but the bottom had started blackening so I pulled them out.You can also rotate the two baking sheets midway though I did not as my OTG was smaller with top and bottom coils.The baking time also depends on your oven as well.Cool for 5 minutes and then serve sliced. It does not look perfect but not at all a disaster I definitely enjoyed the making process as well as gorging process. Just love both focaccias...gorgeous breads! 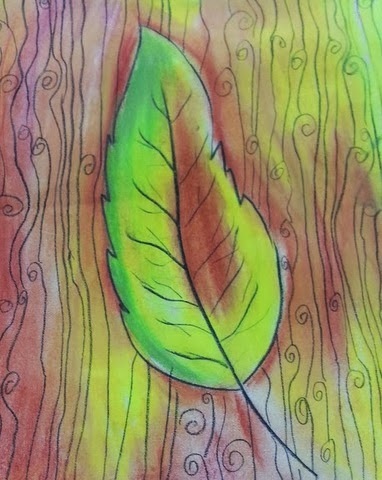 It looks lovely for sure. I just posted my thyme filone. Wow they are true beauties both of them and delicous too. wow.. fantastic breads..looks delicious.. & great entry ,nice click..
What a co-incidence! I made focaccia yesterday too! But the toppings were nothing as exotic as yours... just plain old onion and garlic. I saw a recipe on TV where the chef piled on loads on halved grapes onto the focaccia. I was curious as to how it would have tasted. 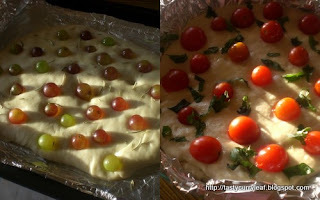 Grapes in focaccia, I would love to taste the sweet salty version! Both sounds exotic. cool.. you made focaccias at home? great! Wow! awesome.. Looks delicious. Wanna to have a bite. Looks gorgeous with the toppings. I could never have imagined a focaccia with grapes on it....guess I have to make it know how it tastes. Darn girl, you are too good! I really don't know what's perfect, but this looks damn too gorgeous.... must have tasted delicious too.. Loved the toppings you chose...great twist to the focaccia! WOW!! I follow A Year In Bread religiously, but have never tried most of their bread. Grapes, tomatoes and rosemary sounds interesting. Why do you say the focaccia wasn't perfect? Looks great to me.